Electrode Material Improves Charging and Discharging. Their high energy density and power density have made lithium ion batteries the preferred energy stores in portable electric equipment. However, their development is still in its infancy as far as their use in electric vehicles and hybrid vehicles is concerned. Power density in particular needs to be further optimized and matched to the very dynamic load profile of an electric vehicle. The liquid electrolyte plays an important role as the transport medium in which lithium ions can flow between the anode and the cathode within the battery. However, materials in all customary high-energy batteries for the automotive industry are designed so that the liquid electrolyte is able to wet the electrode surface insufficiently. Expensive, time consuming vacuum and hot storage processes are required to actually force the liquid into the material. For this reason, battery production so far has taken a lot of time and effort to draw the electrolyte into even the smallest pore and, in this way, maximize battery power and battery life. A laser technique developed at the Institute of Applied Materials (IAM-AWP) produces specific surface micropatterns in cathode materials, in this way enlarging the surface of the electrode material. Larger surfaces improve the uptake and release of lithium ions per unit time. This allows batteries to be charged and discharged faster. In using this process, KIT scientists prepare the electrode surface so that the liquid electrolyte is transported into the porous battery material most quickly and homogeneously. 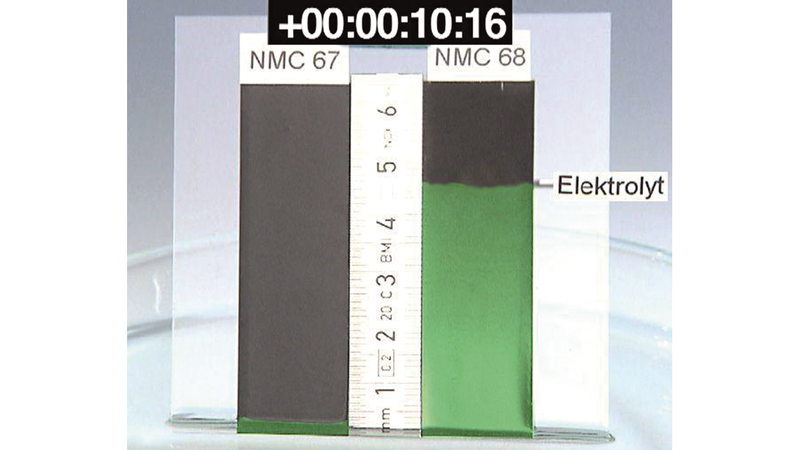 Compared to untreated commercial electrodes, the electrolyte wets the modified electrodes to a level of 80% after only ten seconds. This clearly improves the performance of batteries produced in this way.